Our next project is called Eco, and it’s a game in a new genre we’re calling a Global Survival Game. What does that mean exactly? It means you play in a multiplayer world that has the possibility of being permanently destroyed, resulting in server-wide perma death. What’s more, the reason it’s destroyed would be the players’ own fault. It’s not that different from our own world in that way. It works like this: a new server is started, and players enter at the beginnings of civilization. There’s a world-destroying cataclysm looming, like a drought or a flood or a meteor heading for the Earth, several real-time weeks away. In order to prevent that catastrophe from happening, you need to build a civilization and advance technology and resources to the point that the crisis can be averted. However you’re not alone in this world. 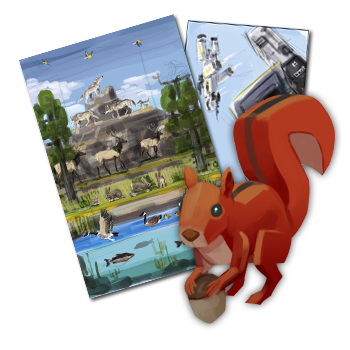 Besides the other players, you’ll be sharing the world with a detailed wilderness simulation full of plants and animals. They simulate 24 hours a day, living out their lives with or without human interaction, growing, feeding and reproducing. Together they form an ecosystem rich with resources, resources that you must use to survive and develop a civilization. However, these resources are finite. Chop down every tree and fail to plant more? They won’t be growing back. Hunt every elk for food? They’re now extinct. Pollute a section of land with mining runoffs? Your crops are poisoned. This ecosystem is your only lifeline in a race against time, your source of resources that will either prevent humanity’s destruction, or become the source of its destruction when the group squanders its resources. Thus you’re facing two existential crises simultaneously: an external threat that you must avert, and the threat of causing your own destruction. A rock and a hard place. To solve this you’ll need to collaborate among a group of dozens of players (and eventually hundreds or thousands of people as we grow the game). You’ll need a strong economy that generates resources that can build the civilization, but that does so in a way that doesn’t destroy the ecosystem. You’ll need to make key decisions as a group as to the best approach to do that, and the game provides you a tool for that, a virtual government. In Eco you can propose and vote on laws that then become physical limitations in the world. Limit the number of trees each player can chop down per day to 10 for example, and they will be physically prevented from chopping an 11th. To aid in arguing for these type of decisions, the player can use data collected from the ecosystem simulation, using graphs and data as support for laws. Together these features create an extremely powerful tool, a way for the group to guide itself and align its interests in the face of impending crises. It won’t be an easy journey. Despite everyone occupying the same world and having the same interest in its survival, individual incentives will make for vastly different positions. Is your character a lumberjack specializing in cutting down trees for their livelihood? You’re likely going to have a different idea as to how many trees should be allowed cut down than others. We’re all in this together, and yet the only enemy is ourselves, the individual’s needs vs the group’s. Will you find a balance? Will your world survive, or be lost and wiped from existence? Eco is possibly the first video game where your character can actually save the world, because the alternative is for once possible. Within the coming months, we will be running a Kickstarter campaign to get this game jump-started, followed by early-access immediately after. We’d like to invite you on this journey, helping spread the word about the game, supporting our Kickstarter, and then participating in development, actively shaping the direction we take. I believe games can be a lot more than they typically are, they can take on rich real-world topics with a depth and meaningfulness that rivals any other form of media, and we want to push how games are thought of with Eco. Many games are designed to allow the player to escape their world, we want to make a game that does the opposite: a game that engages the player deeply with the real world through a concentrated virtual recreation of it. I believe this can have effects well beyond just entertainment. I hope you’ll join us down this unexplored path. Join the discussion on Steam Greenlight! Why not make it possible to use Steam or Curse to play eco? I’m more of an adventure nut, is there room in this game for me to go out exploring and such , also do I have to stick to one job or profession most of the time, you mentioned being a lumberjack and all but If I’m not satisfied with it can I change what I do for a living? Of course, it is designed for students. I want to recommend a website EssayReviewExpert that helps me at the university. This service employs only professionals who do the work efficiently and on time. I am very pleased, try and you. nice details for a brand-new blog writer … it is really handy. Deforestation will affect the environment, planting trees will reduce environmental pollution, thank you for sharing. If I have more than 100 students, would I need to purchase more than one school pack? Does this program work on Google chromebooks? Together they form an ecosystem rich with resources, resources that you must use to survive and develop a civilization. I am very supportive of that. Will eco support Chinese?And will eco be cheaper?So maybe more Chinese players will be interested in it and have more excellent ideas. However,I think eco will be better if players should drink water. Why not make it possible to use Steam or Curse to play eco?So more people will notice it.It is also a good idea to make it support other ways to pay such as Alipay and Wechat payment. Since most middle schools are using chromebooks with their students, will it be possible to run this online or have it on a chromebook or in the chrome webstore. The schools usually dont give macs or windows computers because its easier to download things. I will definitely reccomend this to my school if it does run on chromebooks or in browser. Also, I would contribute to the kickstarter or buy the game, but im kinda broke, I will buy the alpha when I have enough money and will contribute to the kickstarter, thats just not now. Will the alpha buyers have any rewards or any advantages for helping with the alpha? Also, will it be free on full release? Too many questions, but will a server save? or if you move servers will you be able to save your buildings? It is in alpha and is still playable, it just has some bugs and stuff, so you can get the alpha download right now on the buy tab at the top of the screen. Taken a look at factorio? Has a pollution system and in-depth assembly line mechanic. The reason I mention it is I think it has some potential value to consider. It’s a bit ham-fisted about the metaphor, but when the environment is damaged, it will push back in ways we find inconvenient if not outright dangerous. I’m not sure if you intend to have animals more or less directly ignoring players in the final game, but that will only contribute to the illusion that we are but observers in our world. Eco is available now in its Alpha status. We are projecting a full release about a year from now. Thanks! Will eco ever be free to play? Also will it be compatible with mac? This game is incredible. I have a lot of people who recently found this game with me and we are so excited to see the development. This is the game we have all been looking for. I truly believe this genre is genius, thank you so much! This is an amazing project. The whole ‘group together for a singular purpose’ objective is what has got me interested the most. I am wondering, would there be LAN servers, to play over local connections without the need for internet. Also, what do you recommend the minimum number of players be in a server for them to successfully get things done (enough progress) to save the server? Yep you’ll be able to play locally! I expect 4 min will be a baseline. hello i am from Germany and my question is when is the game going to be online and you create different ecosystems? like the german black forrest or something. do i have to play with other people or can i build my own thing? When can we play this game? Im so hopeful. I only wish this had more advertisement I really think people would be interested in this. Looking at this really interests me, I’m curious though: can we customize are avatar? And what animals are planned to be implemented? We’re starting with the Pacific Northwest ecosystem and going from there! Ive been designing tabletop games and web games with green themes for while. I hope your Eco kickstarter succeeds and shows people that ecological themes are perfect for gaming and are fun too! Id love to host your game on the nogo10.com website (with renewable energy powered servers @ hostpapa. Thanks a ton! Yeah hosting would be awesome. Hello! I have fallen in love with this idea since you have showed the first video and quickly pledged to the kickstarter! I see that your doing mods for the game too which is just… I’m just speechless really, thank you so much. This is a game about very real things that need to be talked about and its being presented so well it really just speaks to my heart. I cant wait to play this game alone and with friends and look forward to modding it. On a semi side note, I had an idea; will there be a way to modify the stats that you give everyone? In my own opinion, the realism in this type of circumstance comes from the lack of information/inaccurate information. It would be up to the players to keep track of the amount of moose left and what not. Which would mean that the stats could be changed daily like a log if players so choose to. This would reflect the perceived amount of a resource left vs the actual amount of it. We still don’t know the true amount of all the resources on our planet in real life due to mostly monetary reasons and more. tl;dr will there be an opportunity for players to set the statistics for things? such as a modded server or so. It could just be blank stats with the real stats alongside of it just not visible until a certain scan technology is unlocked. Let me know what you think! Thanks a lot Alex, great to hear you’re on the same wave length as us. I think this will be something really special. As for stats, you nailed it what we want to do: players will have to collect data to make it available for viewing, so there’s a research aspect to the game, from which you can use data to make arguments about what’s happening and what should be done. We’re positioning scientific data at the core of the way players argue about making laws and decisions about the world, and collection is a big part of that. Can I just say, this game sounds incredible? I love the idea so much!! It reminds me of the sort of game that I could only dream of, filled with so much room for… everything! Super excited for the alpha release, and I plan on sharing this with all my friends! Well done. I’m so enthusiastic to see a game like this being developed. There are no shortages of eating games and building games, but they all same the same critical flaws. I’m a supporter of the Zeitgeist Movement and The Venus Project, and I believe that a Resource Based Economy is the only hope we have to survive as a species. 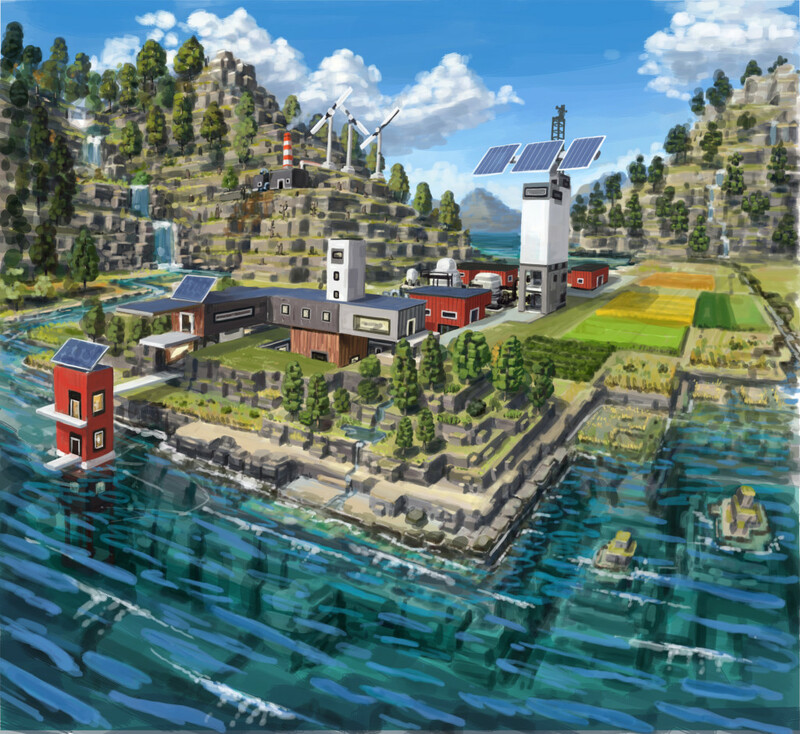 It’s nice to see a game being developed on the ideas that we need to evolve as a species and care for our environment, and treat our planet the way it needs to be treated if we want to flourish. Is this going to be a CPU only game, or is it going to be available for mobile devices in the form of an App? I think an app would be an EXCELLENT idea. Keep up the great and inspired work!! <3 Glad to see other TVP Supporters here! Thank you! We plan to do mobile, tablet especially, and also special apps to let players interact via phones in special ways. Two thoughts – possible to have two worlds/servers – one for children and another for adults? I am thinking about some Minecraft worlds where there is a creative side where kids can try out things without dying quickly. It could even be the same style world but with parameters set to a better probability of surviving and simpler rules to follow to survive. They are the ones that are going to inherits what we all end up doing , so their buy in to the concepts from an early age is good. Another – have a link into the Transition Town network – ways for people to explore the story about climate change, resource exploitation, money etc could be a useful tool to promote. Sim city et al seem to be about earning money, getting things rather than learning about communities etc, so this simulation sounds good. Thanks Belle, yep players can host their own servers with mods so there will be a ton of flexibility. Havent seen transition town but it sounds interesting. Great game! I’m anxious to play it! Sounds like a mix of Minecraft with Bitcoin mentality! If delivered what promised, it’ll be ingenious! I’ll show it to my students. Very excite by the concept of this game, I am a member of a small – medium gaming group with a few dedicated servers. Will there be a private server option for groups? just to offer more control against griefers and trolls. Will be keeping an eye on your website and kickstarter so I can help fund it. 6. what will you do with the extra money if it go’s over goal on the kickstarter, go to the game immediatly or be put in a fund for later. 8. is there a building limit upward? 13. are there going to be ways of dieing by the environment (tree falling on you, boulder falling on you, lava, (most likely) fall damage. 15. is there going to be a chat. 20. is there blood (i don’t think there is)? 2. No, the players will have to make them quickly. But at the start you will have very little technology and cant do much damage. As your tech improves, the more damage you can do to the environment. 3. When it’s dead it’s dead forever. You can start a new server if you like. 4. Yes, you can prevent the meteor strike if you develop the right technology (unless you kill the planet in the process). 6. It will go towards our stretch goals, and just a rainy-day fund beyond that. 7. We may implement the ability to drill through to the other side of the world. For now it’s a hard barrier at a certain depth. 8. Currently no. We’ll implement one though. 10. Yes, we will do higher tech like that. Transport will be huge, because transportation is one of the key ways an environment is transformed. 13. No, you can only die if you break a law whose penalty is death, and that is permanent (character wipe). Other than that, youll have low health till you revive yourself with food, rest, and medical treatment. 14. Yes, in addition to stores which let you do so offline. 16. It should be not laggy at all, but if you have a slow internet not much we can do about that. 18(19). Yep automatic mod downloads! 19(20). Nah, maybe when you shoot an elk? Probably not, the game isn’t about that. This game seems more interesting than what I initially realised. I wonder what kind of virtual society will be created when only the people (away from corrupt governments and greedy corporations) decide about which laws to abide, and what kind of life they want? Looking forward to play this game. This is the kind of gaming that can educate and be tons of fun. You are continuing a movement that makes education as fun as gaming! GREAT. I hope new kids get to game instead of assist to outdated traditional learning classes. Massive supporter here. Looking forward to your crowd-funding site, indiegogo or kickstarter! One got to wonder why it took so long for the games industry to finally realize that they are an important part on the education (in particular of the next generation). As Carl Sagan used to say, with so much violence on tv (or on this case games) eventually “they” will get it. Producing this game can be quite useful if the relationship between the limitations of the virtual world on the game and the physical limitations on our planet is clear, otherwise it will be just another game to entertain the masses. Let’s hope it can be an important tool on waking up the general population for the nightmare we are all heading to, but you’ll be facing some interesting problems. The game description mentions some kind of imposed limitations to consumption of resources, but will the game be limited to the current socio-economic structure and values or will there be some room to experiment something different? Will the game include the modern consumption values as a status symbol, and a way to measure life quality? If so then it will become a mirror of our system, and given the need to survive and satisfy consumption habits, the game will always end up with resources depletion, high inequality between players or a mixture of both (as it happens today). Will there be a way to control population and therefore overall consumption rates? if so how will this be done? Imposed, through education? Will the game have in consideration the increased efficiency of production as technology evolves (ie: producing more with less)? This could delay the resource depletion, and increase their competitive advantage toward the other players, but given that this efficient technology will produce unemployment, how will the inhabitants earn their living and afford to buy products that will in turn pay the miner, logger, etc? The way I see it is, either you make a game that actually makes the difference, or it will be just another idea where lots of talent will be wasted with little to no significant impact on the real problems we are facing today. The root of our socio-economic problem is on the way our economic system was designed (an economy that requires exponential growth and consumption on a finite planet, where as a consequence of the need to keep the economic machine going, it disregards human needs, the planet, etc), so it would be interesting to let players change not only consumption of available resources but also the economic system to see the possible outcomes. What if instead of creating unemployment with technological efficiency, the population would become free from their jobs and became more focused on education and development of better technology, so that an even more sustainable future could be achieved? For this to happen there has to be the possibility to change the economic system into a something like a money free system (otherwise, no work no money). And since the modern consumption values are created by the need for our economic system to keep going, wouldn’t that change those modern consumption values to more sustainable ones? Again, your game idea has a lot of potential and can give plenty of food for though to players if related with real problems. What will be the point of making another game, simply for entertainment to add to the many thousands already available? For better understanding of the causes of our socio-economic problems I would recommend checking out any of the great talks by Peter Joseph (founder of the Zeitgeist movement) and also by Jacque Fresco (The Venus Project). The following talk goes to the core of the socio-economic problem. The government is malleable by the players. The values of course will be completely determined by what players bring to the table. I suspect there will be different ‘cultures’ per server, and probably servers were consumption becomes a status symbol and players exploit their environment into their own ruin, coming up with excuses at every step why its ‘ok’ to clearcut this forest, etc. Population is determined by the number of actual players in the world, and they can consume various amounts. Depending on consumption, a high-pop server could actually use fewer resources than a low-pop one, if the players use less each. Population will be simulated by consumption per-person, basically. Yes, and those problems you describe are the things the game focuses on. Making decisions as a group that are not obvious, which is more important, employment of sufficient use of resources? It’s up to the players to decide, and the simulation determines their success. Exactly, the system itself is malleable. Creating social and economic structure will be some of the root causes of success. You’re not just deciding how you use resources, but deciding how players may decide to use resources. It’s a level up. Hi! Congrats for this project!!! I work on sustaintable development in my county, and this is a fantastic teaching tool. Is it possible to get a copy? Watch for the Kickstarter for early access! I am really looking forward to try this game. I have been looking for months for a game of this type now and I have finally found it. Ecology and sustainability are the keys of our future and you are doing a tremendous job as it will educate our next generation. Fingers crossed, release it ASAP! hi guy sorry for my other comments im just so happy for this game to come out. i saw the steam community really happy to. i just wanted to ask if you now have a release date and if there will be servers where lots of people can join? No release date yet, but Kickstarter supporters will get early access, and we’ll have public servers with max players allowed. Sounds awesome, really can’t wait for release! Today I was checking my fb and found out on MMO an article talking about your game, this interested me and made me come here. First of all the work youa re doing is incredible and I wish you luck with it, Ill try to support you in anyway I can. Why? Because Im a Biology student from México and Im interested in ecology research, I just cant imagine the possibilities your game will have not only as entertainment, but also as a teaching tools or even as an ecosystem management simulator for those wishing to make ecosystem management in actual ecosystems. Ill keep an eye on your project and specially on the kickstarter. Cant wait to see how your game turns out. My name is Clément Scherpereel, I’m a french 3D artist, designer and ecologist enthusiast . I discovered you Project ECO (kind of eco-responsible minecraft) and I really like your project. I’m really concern about the future of our planet and most important, our future on this planet (because the planet don’t really care about us messing around). You’re concept is great and there is so much possibility I can imagine ! I would like to offer my skills as a 3D artist and eco-structure concept. I’m very found of eco-structure and concept about creating clean energy and sustainable development. As I said, I’m offering my skills, I’m willing to work for free because I believe we can awake the gamers to the responsibility we have for our future generations and I believe in your project. I’m sorry I have contact you with the contact page but the contact link doesn’t work. Anyway if you’re not interested I’m sending you all my energy for this great project and I’ll be following it with great interest. I hope to hear soon from you. Feel free to ask me anything. Hi, John! My name is Dallon Moorefield and I’m a member of a new website called the Collection Gaming Network. It’s an interesting idea being the first Social Network for gamers. We act as a hub for streamers, Youtubers, Let’s Players, commentators and the like and are growing super fast. We would love to help get your game out there so if there’s anything we can do to help advertise and pass along information please don’t hesitate to let me know! Please check us out and let us know if we can help you out in any way. We just recently hosted adultswim games newest release, “The Duck Game” on our page and helped them dramatically increase the amount of buzz about the game. Thanks for reading and good luck! I wonder how are you planning on somehow “forcing” the cooperation. Human beings are usually egoists and there are millions of trolls out there. No forcing. If they dont collaborate, the world dies along with everyone in it. Its a world with consequences. Hi, I’d like to know if this game will ever have a server where there is no “Countdown to the apocalypse” scenario. This game sounds like a really good idea – and although you’re using kickstarter, I do hope your game does actually get made and you get the features in you’ve advertised. I personally would love to play it, although I am heavily against funding kickstarter campaigns due to the countless times where developers have, to put it plainly, “Taken the money and ran”. I may support this project if I got more details in regards to how far technology can progress, can I start a war with another group of players? How many players will be on a server? Will there be a “no time limit” mode? These kind of simple things. We also have funding from a grant, so we’ll definitely be creating something and fast. We’ll have lots more details coming soon, in our Kickstarter and this blog series. Thanks for the reply, John K! I’ll keep watch on the kickstarter and this blog. This game definitely interests me, and I’d love to see just how far technology can go. I was reading your recent post about the world being “Doubly Doomed”. Is it possible that the meteor can be deflected, and the world continue on? I’ve got so many questions in regards to the details and design of the game. I used to work as a full time game designer and developer, and now-a-days take it up as a hobby as I’ve moved jobs. I’d love to be of some help to the project. Oh, Just a note: Finding your reply was a little difficult! The link in the email took me to the Eco main page, where there were no comments. I had to browse through the blog posts to find it! This is probably one of the best ideas I have ever seen. You guys, if you do this correctly, are going to make a game that will create the effect that Minecraft had on the gaming community. However, instead of a sandbox game revolution, this will be a survival game evolution. Not only will it teach people about the effect of humans on their planet, but it will also create a fun environment in which this is achieved. The minute this game goes on kickstarter, I am donating at least 50$ Good luck! Hey! I think the concept of this game is awesome! can you explain to me what a kick starter campaign is though. Hello, I would like to say that you did great job. Keep moving right way! I’m emailing you to ask if I could help in any way in the development of “ECO,”as it sounds extremely good and a fabulous idea and as I do have experience in game design and 3D design and I find it interesting and enjoyable and I would be very welcome to help you. Possibly, email me john@strangeloopgames.com. Thanks! Looks great, if you need some feedback, i’d love to help out. Is there a planed price for the game and if so is it possible it may be free or at least have a free trial. Hey, i just subscribed to your e-mail list for updates and was just wondering if i could ask a few general questions about ECO. #1 How long has this game been in development? #2 Where can i purchase this when it is ready? #3 How much will you be charging for it? #5 What is the teams background in gaming in general, like are they industry people that have worked on at least one game other than this? #3 Unsure, similar to other games though. $20-$35 range. #4 Yes, in the form of allowing players to break laws. Check out our laws blog post. #5 Industry folks, we’ve been indie for 5 years, before that we worked at EA/Midway/Microsoft. Game industry background. There will be punishments for players that break laws and are caught, including perma-death/banning. On another note you say advancing civilization and researching new technologies, how will that work? Someone go to a lab and just research all day or what? Doesn’t seem very fun if that’s the case. And a curious note , if the world itself can be destroyed , what’s stopping a troll or heck maybe a self-styled Super-Villain to destroy the world? 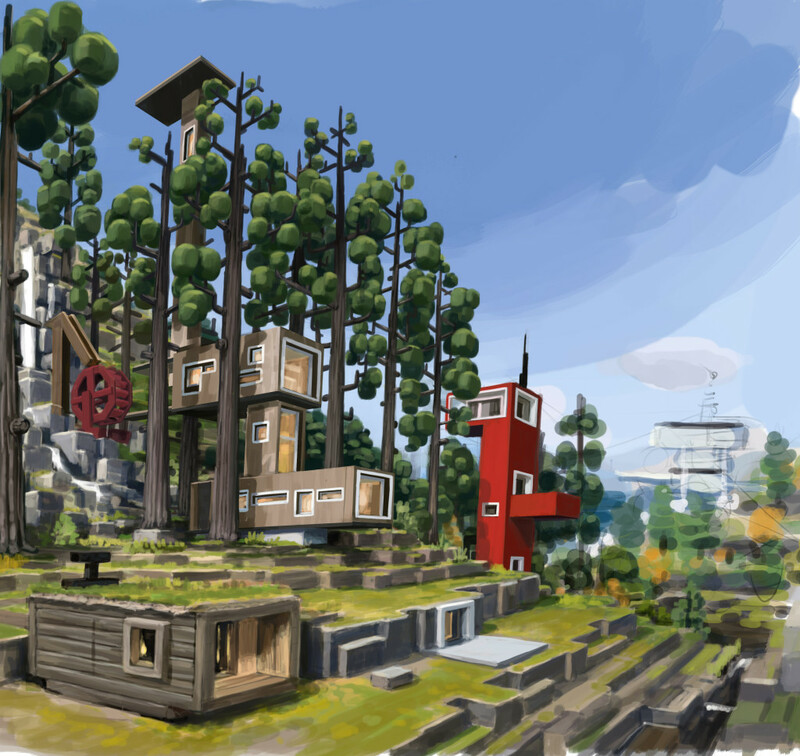 At the start of a server there will be lots of exploration and building a civilization. Towards the end of the game the full planet will likely be explored and exploited. Researching will cost resources, you spend them to get new technologies, almost like crafting. It will take huge amounts of resources and labor from many specialized players, thus the player economy to connect it all together. And yes there will be super villains 🙂 They can be controlled via laws though, the group defines what’s allowed. Receive important updates and info about early access. Instantly get free concept art.